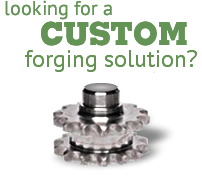 At Green Bay Drop Forge, quality forgings begin in the engineering and product development department, where our expert engineers set us apart. Green Bay Drop Forge stocks thousands of our standard parts in blank, machined and plated versions for immediate delivery. For our custom forged products, we regularly work with our customers to build ahead and split ship according to their production schedule. As part of our ongoing ISO/TS 16949 & ISO 9001 registrations, producing nothing less than the highest quality steel forgings at Green Bay Drop Forge is paramount to our doing business. Whether it’s related to cost reduction, quality, storage, assembly or aftermarket, we can create a plan to ensure your product is integrated to the right level at the right time- to meet your unique and demanding schedule. To achieve a seamless exchange of data, Green Bay Drop Forge provides an Electronic Data Interchange (EDI) service to support our EDI capable customers. EDI automates the exchange of documents and data between our trading partners.